Well-oiled machine or broken-down junker? 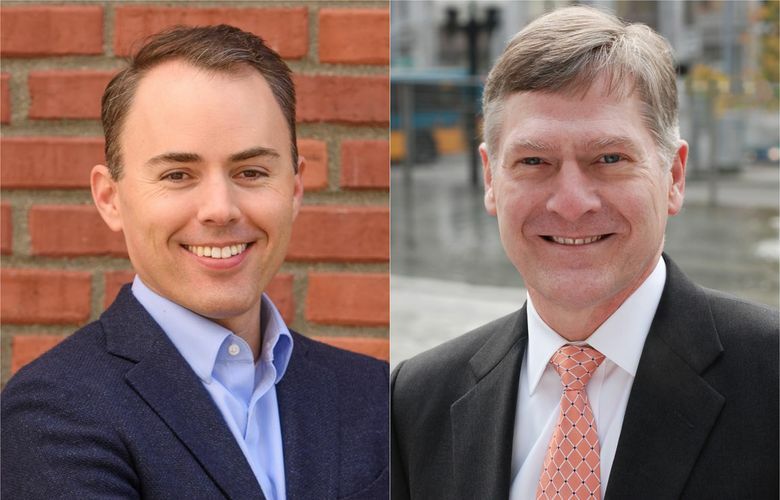 Incumbent Seattle City Attorney Pete Holmes and challenger Scott Lindsay don’t see eye to eye on much of anything when it comes to running the city’s law firm. Where challenger Scott Lindsay sees a broken, dysfunctional criminal-justice system, incumbent Seattle City Attorney Pete Holmes sees a high-performing office that’s taking on cutting-edge legal battles and winning. Lindsay, the former public-safety adviser to ex-Mayor Ed Murray, said Holmes lacks the vision to work with the city’s Municipal Court, Police Department, City Council and mayor to construct new harm-reduction strategies to improve public safety while addressing the connected issues of homelessness, addiction and property crime. Holmes said Lindsay is woefully inexperienced to run an office of 100 attorneys over eight divisions who are responsible for prosecuting misdemeanor-level offenses, advising and representing other city departments and defending the city against a cavalcade of lawsuits. Lindsay is essentially trying to leap from junior associate to managing partner, said Holmes, 61, who spent two decades in private practice before beating out incumbent City Attorney Tom Carr in 2009 and running unopposed in 2013. Holmes, a participant in this election’s Democracy Voucher program, hit his $150,000 cap under the program last week, with about 60 percent of his campaign funds coming from vouchers. Lindsay has raised roughly $140,000. Nearly 30 percent of contributors to Lindsay’s campaign live outside Seattle city limits, compared with roughly 7 percent of Holmes’ campaign donors, according to data posted by the Seattle Ethics and Elections Commission. Holmes has racked up an impressive list of endorsements, which includes current and former city and county officials, state representatives, judges, Gov. Jay Inslee and former Gov. Gary Locke. Lindsay’s list is much shorter, and is topped by endorsements from the Seattle Firefighters Union and The Seattle Times editorial board. Most of Lindsay’s 12-year legal career has been in public service: He served as senior counsel in Washington, D.C., to Rep. Elijah Cummings of Maryland and led major investigations for Democrats on the House Oversight and Government Reform Committee. He joined the Seattle mayor’s office in 2014. As public-safety adviser to Murray, Lindsay engineered the city’s “9 ½ Block Strategy” to combat open-air drug dealing in Seattle’s downtown core and created “navigation teams” of police officers and outreach workers to help relocate residents during controversial sweeps of the city’s homeless encampments. “When there is a mess or a dysfunctional system or something badly broken, I’m a good guy to look at the problem, unwind it and fix it,” Lindsay said. Lindsay — who was admitted to the Virginia bar in 2005 and the D.C. bar the following year — acknowledged he has very little courtroom experience. He was admitted to the Washington State Bar Association on April 19, 2013. When he announced his candidacy on April 27, Lindsay had just met the four-year minimum requirement for city attorney outlined in the city charter. “We’re in court every day. You can’t direct 100 lawyers without walking a few steps in their shoes,” Holmes said. Probably best known for sponsoring the initiative that led to the legalization and regulation of recreational marijuana in Washington in 2012, Holmes has embedded attorneys in the Seattle Police Department (SPD) as part of continuing reforms under the federal consent decree. “We problem-solve, we help the cops, we’re not the enemy. We’re probably the best hope for the department emerging from the consent decree and enjoying a better, lasting relationship with the community,” Holmes said. Lindsay has been critical of Holmes’ use of outside counsel to defend lawsuits against the city, as well as what he sees as a dismal decline rate in nontraffic criminal cases — that is, the number of cases in which assistant city attorneys decline to file charges. According to Lindsay, the City Attorney’s Office spent $1.4 million on outside legal counsel in 2014; $5 million in 2015 and $7.7 million in 2016. And while he acknowledges the city has seen a spike in the number of lawsuits filed against it, Lindsay said it still doesn’t add up. The city has spent more than $500,000 on outside counsel in the federal lawsuit filed by the American Civil Liberties Union on behalf of two homeless women whose possessions were destroyed during an encampment sweep orchestrated by Lindsay during his time in the Mayor’s Office. Holmes stands by his decisions to solicit outside help to defend the city in a wide range of high-profile cases. Some firms take on the city’s cases pro bono, while others work on a contingency basis or offer municipal rates well below their usual billing fees — and they’re willing to do that because defending city ordinances, like the income tax on wealthy residents approved by the City Council this summer, “is so cutting edge,” he said. “Lawyers specialize, just like doctors. And you do not dabble,” said Holmes, who estimates more lawsuits have been filed against the city in the past 18 months than during the first six years of his tenure. As for filing rates, Lindsay said charges brought against misdemeanor defendants have dropped precipitously since Holmes took office in 2010, with city attorneys now declining to file charges in nearly half the cases referred by Seattle police. “We are basically waiting for them to commit a felony before dropping the hammer on them. That’s not a good strategy for the defendant and it’s not a good strategy for the community,” Lindsay said. At the same time, Lindsay is a proponent of creating additional programs to help divert frequent fliers out of the criminal justice system, with the goal of addressing mental health and chemical dependency issues, reduce harm and change behavior. “It’s smoke,” Holmes said of Lindsay’s criticism about his office’s decline rate. Holmes countered that he has 24 attorneys to review the 14,000 criminal cases referred to his office by Seattle police each year. There’s a number of reasons charges are declined at the misdemeanor level, he said. In domestic-violence cases, for instance, sometimes filing a charge will make things worse instead of better for victims, while in other cases, there’s no benefit to the city or defendant to follow through on a prosecution, he said. Holmes recalled a case from earlier this year: A 19-year-old African-American man with no criminal history was pulled over by a police officer at 1 a.m. for driving without his headlights. The officer thought he smelled pot, so obtained a warrant to draw the man’s blood, which came back with 1 nanogram of THC, the active ingredient in marijuana, per milliliter of blood. The legal limit for drivers is 5 nanograms per milliliter, but it’s illegal for anyone under 21 to use marijuana, Holmes said. “There was no accident, no lane violation, no nothing,” Holmes said of the case that could have resulted in jail time for the 19-year-old. An assistant city attorney declined to file the misdemeanor charge, but then filed it after the cop who pulled the man over “raised hell,” Holmes said. The man’s stepfather brought the case to Holmes’ attention; he then signed the dismissal order himself.